Scatterbrain. : A Sure-Fire Sign of the Apocalypse. 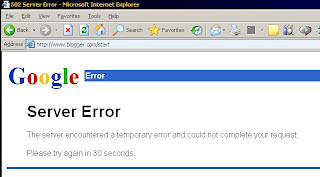 I'm thinking "Google: the Microsoft of the future"
How long did it take to get back up? I tried to open Blogger an hour later and it was still down. It worked fine when I tried it the next day. i.e. I have no clue what the timing was.